The ups and downs of racing were starkly demonstrated by Nobuyuki Oyama on the final weekend of the season. The Japanese rider notched his first Korean winner at Busan on Friday before suffering a nasty fall in trackwork the following morning which looks set to rule him out for at least a month. Oyama, who is married to former Busan jockey Hitomi Miyashita, joined the track at the beginning of December and despite coming close on several occasions, hadn’t made the breakthrough until Friday. That changed in the last race of the day, the feature class 1 handicap when Oyama guided 4-year-old Heba to victory over a very competitive field that included well-known names such as Gamdonguibada and New York Blue. It was a 7th career win for Heba (Peace Rules) and looked to be a win that could kick-start Oyama’s time at Busan. Unfortunately that is going to have to put on hold for now after the 46-year-old suffered a leg injury in trackwork the next day. 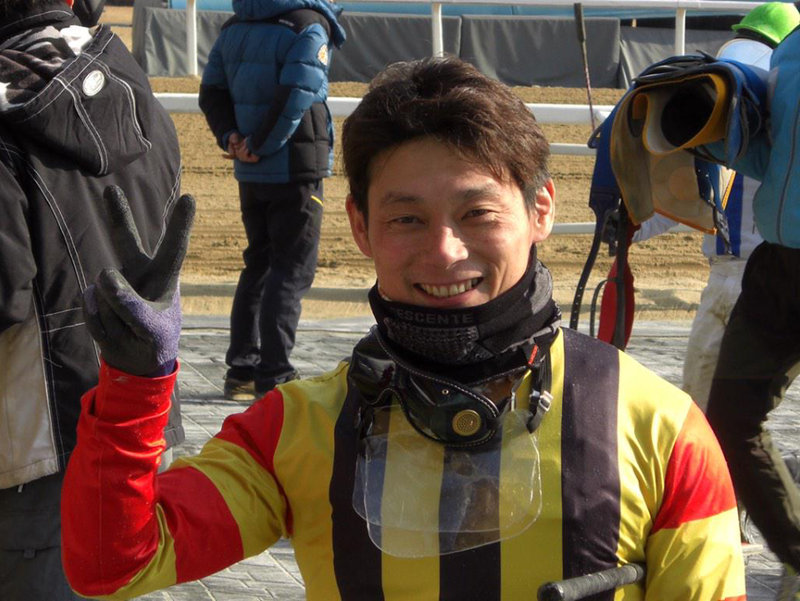 Ikuyasu Kurakane has been named Seoul Racecourse Jockey of the Year and the Japanese rider celebrated in style on Saturday by riding a treble to become the first ever foreign rider in Korea to claim 100 winners in a season. While Moon Se Young was crowned champion with an out of sight 162 winners (which won’t be added to after he was slapped with an 8-day ban by stewards last weekend), it was Kurakane – who gets nothing like the pick of the rides Moon does – who was adjudged to be most desrving of the award. And the hardest-working jockey in Korea – riding 8-lots each morning is the norm for Kurakane – has certainly had a great year. A clear second in the Jockey Championship, he began Saturday on 98 winners. He was soon on 101. He took race 3 on 11/1 chance Yeoui King (Admire Don) to move to 99, before completing his ton an hour later as 5/1 Grand Bleu (Peace Rules) did the business in race 4. The best was yet to come though as he threaded his way through a crowded field to steer 16/1 chance Queen Pico (Pico Central) to an unlikely win in race 5. It’s a year that saw Ikuyasu win the KRA Cup Classic on Samjeong Jewang but the majority of his wins come at the less glamorous end of racing here. Hard work has certainly paid off and he is in great demand among Owners and extremely popular among punters. They will be hoping that the 39-year-old isn’t quite done in Korea yet. Hangangui Gijeok was the star of the show in Korea this weekend, scoring a dominant 12-length win over Derby and Oaks winning filly Queen’s Blade at Busan on Friday. Ineligible for the Triple Crown races this year due to being a gelding, Hangangui Gijeok went up to Seoul last month after seven conseuctive wins at Busan including the Gyeongnam Governor’s Cup. He finished 4th behind Gyeongbudaero, who would go on to win last week’s Grand Prix Stakes but was the best of the three-year olds in the race, ending just a nose ahead of Queen’s Blade. There was rather more than a nose between them when they raced over a mile in Busan’s Friday feature. leading from gate-to-wire, Hangangui Gijeok finished a full 12-lengths clear of Queen’s Blade who put a further full 4-lengths between herself and the rest of the field. Hangangui Gijeok moves onto nine wins from twelve career starts and his 2015 campaign will be one of the most eagerly awaited on the peninsula. At Seoul, the feature race was on Sunday when Gwanggyo Bisang struggled under top weight of 60Kg in the big class 1 handicap and could only manage third place as Namhae Daewwang (Commendable) landed his second consecutive win at the highest level. Four of the four-year old’s six career wins have come this year and he closed late to overturn a tiring Nulpureunchongyong in the closing stages of the 1800M event. Jockey performance of the weekend came, as usual from Moon Se Young, who partnered five horses to victory at Seoul on Saturday, before adding another two on a snowy Sunday. Among them was the still unbeaten US import Bear Queen Trophy (Exchange Rate) who made it three wins from three starts on Sunday afternoon. Joe Fujii too, got the second win of his comeback from injury on Sunday, guiding the Kim Young Kwan trained Buho to race 6 at Busan on Sunday. While the racing season was originally scheduled to finish on Sunday, an extra set of cards have been added for the final weekend of the year with a bumper 13-race card at Busan on Friday and the usual weekend racing around the three tracks. There are some big fields in store, especially at Seoul, and racing will be simulcast to Singapore on Friday and Sunday. Gyeongbudaero became the second horse in as many years to complete a President’s Cup / Grand Prix Stakes double as he swooped late to win Korea’s most prestigious race this afternoon. The 5-year-old, who won the KRA Cup Mile (Korean Guineas) two years ago, was sent off at 13/1 for the season-ending showpiece with Beolmaui Kkum the favourite for the second year running. And as a light snow fell over Seoul Racecourse, it was Beolmaui Kkum who, as expected, set the early pace with Magic Dancer and the outsider Rush Force in close attendance. Gyeongbudaero was leading only three as they began the long turn for home. As the field entered the home straight there was a nasty incident as Nobody Catch Me slightly interfered with Samjeong Jewang. The latter and Ikuyasu Kurakane tumbled to the ground although thankfully both would get up and walk away. Nobody Catch Me was disqualified. None of that affected the result. Gyeongbudaero had improved around the turn and went wide in the straight, hitting the front with just over a furlong to go as Beolmaui Kkum and Magic Dancer began to tire. Wonder Bolt came up to challenge but Gyeongbudaero was gone, winning by three lengths on the line. For Gyeongbudaero, it was an 11th win on his 28th start and takes him to over $2Million in prize money won. He follows Indie Band in winning the President’s Cup and Grand Prix Stakes in the same year. Crucially too, he is another Korean bred winner of Korea’s best race. Wonder Bolt was game in second and Beolmaui Kkum will be back. Clean Up Joy was a revelation in 4th although Magic Dancer would have been expected to go better than 5th. The doubt about Gyeongbudaero had been whether he would stay the trip. The way he ran today, he could have stayed all the way down the “Gyeongbudaero” Highway back home to Busan. 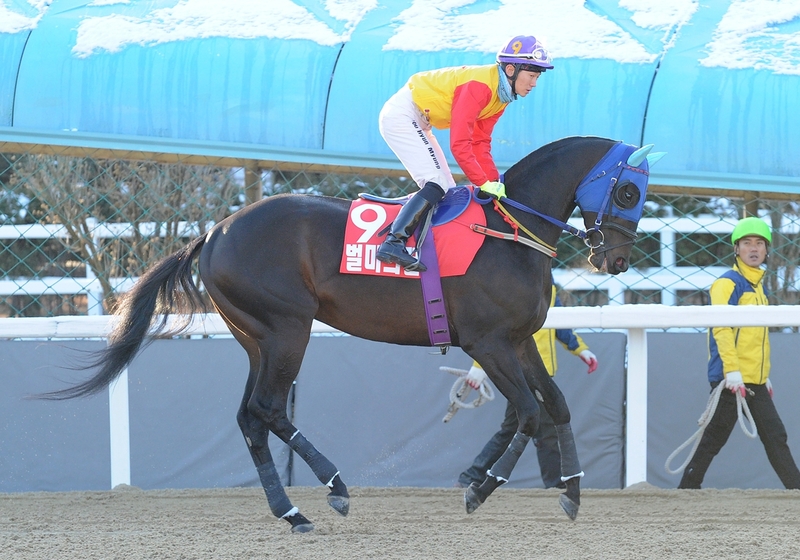 Gyeongbudaero is an emphatic Grand Prix Stakes Champion of 2014. It’s time for the big one. The 33rd Grand Prix Stakes will be run at Seoul Racecourse this coming Sunday. Despite the injury-enforced absence of defending champion Indie Band, the race still looks to be one of high quality. And while last year’s event was the first ever Korean race to be broadcast live overseas, this year’s edition breaks new ground too with European punters able to bet on the race with the French PMU. Beolmaui Kkum is likely to start as the strong favourite for the 2nd year running with jockey Lee Hee Cheon, who won the Minister’s Cup at Seoul in October given the chance of a lifetime to reach his 100th career winner in style with Choi Si Dae retained for Gyeongbudaero. Last year, Beolmaui Kkum faded badly in the home straight but is in great from this time around and will be hard to beat. Magic Dancer may challenge Beolmaui Kkum for the lead and has every chance of staying on whereas likely to come from further behind are Cheonji Bulpae and Nobody Catch Me, both of whom have claims. 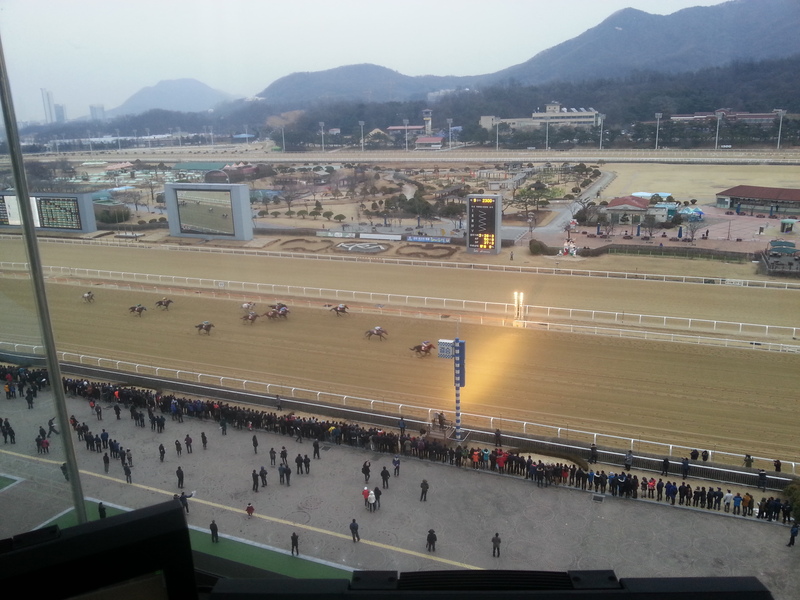 Gyeongbudaero won the President’s Cup on this track a month ago but may find the this a little bit too much while Wonder Bolt has improved plenty since his 5th in the race last year despite being more renowned as a sprinter. Ghost Whisper is game but may find himself overmatched here while Clean Up Joy and Samjeong Jewang have plenty of potential and are the wildcards. One of the up and coming talents at Seoul, following a 6th place finish on his debut, he hasn’t finished worse than 2nd in seven subsequent starts, usually coming from just off the pace to close strongly. A winner over 1800M last time out in what was his first attempt racing around two-turns promoted him to class 1, but he faces by far his toughest race to date. Twelve months ago, he started as the favourite for this race and led the field into the home straight before fading disappointingly to 13th. He had five months off earlier in 2014 and since returning, he’s won all four of his starts. He will be the favourite again, having broken the Busan track record over 2200M on his last start and he will probably lead again. This should be his year. The highest rated horse in training at Seoul, Wonder Bolt was 5th in this race last year. He has spent much of the year racing at shorter distances, finishing 2nd behind Singapore’s champion sprinter El Padrino in the Asia Challenge Cup in August. A very comfortable winner over 1700M last month, he is very quick and will have some supporters for the Grand Prix. He was 2nd behind Samjeong Jewang in the KRA Cup Classic over 2000M on his last start in October, only beaten a nose and finishing the quicker of the two horses. He should like the distance but is yet to find the winner’s circle at class 1 level – his last victory was all the way back in February – and he is unlikely to find it in this race. The winner of one of the Korean Triple Crown races last year, he spent the first half of 2014 in the United States. He was unsuccessful there and returned to Korea in August. He has raced four times since, winning once over 2000M. He is a very capable competitor but will probably find a few too quick for him. A narrow win over Rush Forth in the KRA Cup Classic in October was the fourth consecutive victory for this up and coming gelding. He likes to come from slightly off the pace and he has a strong finish. He’s going to need a very strong one in this company but is certainly not without hope. Three-year-olds have won the two most recent editions of this race. Now from the stable of Peter Wolsley at Busan, Cheonji Bulpae was an impressive 3rd in this race last year. He’s only won two of his seven starts in 2014 but has usually been close and has been carrying some big weights in handicaps. While he won’t be favourite, he has every chance of coming close again. Trained by Kim Young Kwan at Busan, Magic Dancer is a proven winner at Seoul Racecourse, having won the Jeju Governor’s Cup over 2000M in June this year. He finished 3rd behind Gyeongbudaero in the President’s Cup last month and should have no problems with the distance. Jockey Joe Fujii is the only foreign rider to have won the Grand Prix and what tactics he employs could be the key to this race. 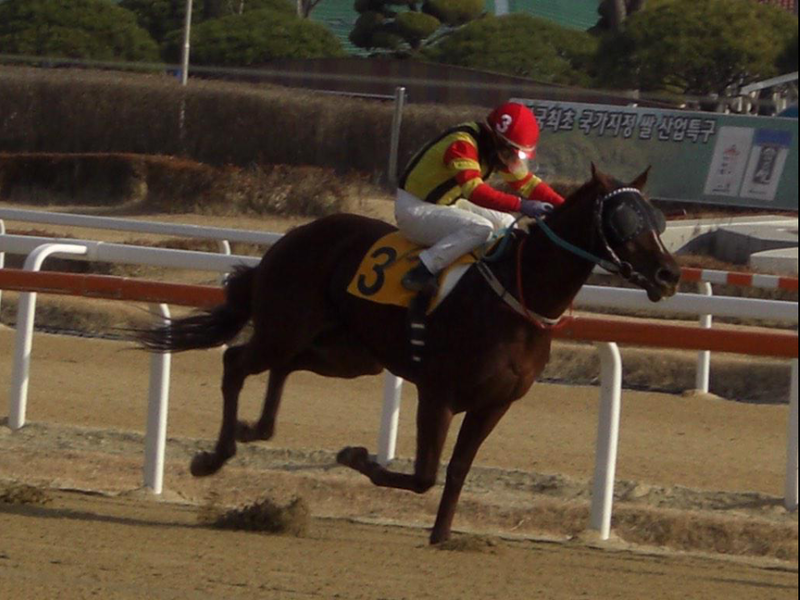 The highest-rated domestic bred horse in Korea, Gyeongbudaero finished 6th in this race last year. He has only run three times in 2014 but the most recent of those saw him land the biggest victory of his career, the President’s Cup, over 2000M at Seoul Racecourse last month. In 2013, the President’s Cup winner went on to win the Grand Prix and while Gyeongbudaero won’t be favourite, he can never be ruled out. He was a convincing winner of the Busan Metropolitan Stakes – known as the “Summer Grand Prix” – in July at odds of over 50/1, beating a number of his rivals here. He’s only run once since then and that too ended in a win, carrying 60kg around 1900M and still winning by 5-lengths and breaking the track record in the process. 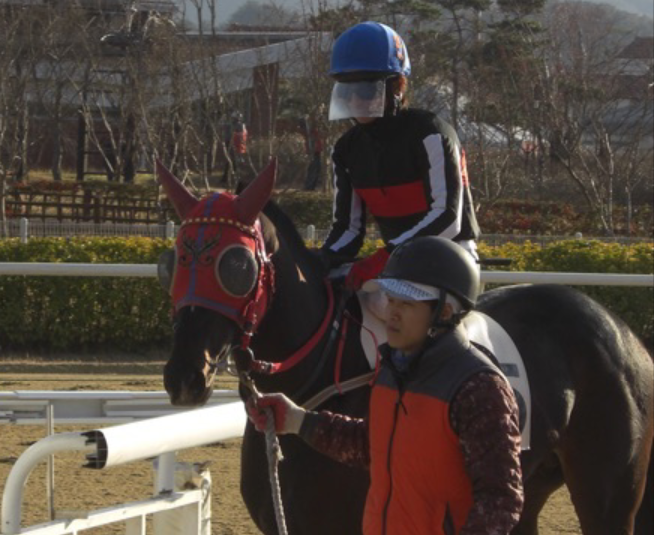 One of two contenders from the stable of Busan’s top trainer Kim Young Kwan, he has a chance. A distance specialist, Unbeatable won the most recent of very few races to be run over 2300M at Seoul last month, holding off several rivals in a tight finish. He’ll definitely stay on but that race was run at a pace significantly slower than any recent runnings of the Grand Prix and while he was quick at the finish, this is a significant step up in quality. A very game horse and with plenty of talent too, he’s won four of his last six starts, usually from the front and broke the Busan track record for 1800M in October. Trained by Australian Peter Wolsley, he’s never without a chance although the distance and the caliber of opposition may be just a little too much for him here. The only filly in the race, she is likely to be the longest shot on the board. She’s only raced five times in 2014 with a best finish of 5th and she came home in 6th place in a Stakes race restricted to fillies and mares at Busan last month. As a result, even with the champion jockey on board, she is overmatched here. 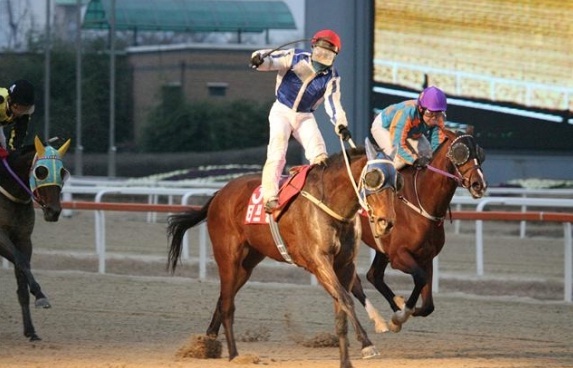 Cho Kyoung Ho, one of the top Korean jockeys of the past decade, has retired. The 38-year-old’s current license expired on December 7 and he opted not to apply for renewal. Debuting in 2001 at the rather advanced age of 25, as was common for Korean jockeys at that time, Cho quickly became one of the top riders on the peninsula. His first Stakes win came in the 2003 JRA Trophy on Tempest West and he would partner the same horse to victory in the Grand Prix Stakes later in the year. He would win the President’s Cup, Korea’s richest race, on four occasions with back-to-back wins on Myeongmun Gamun in 2007 and 2008 a highlight but it is for his partnership with Tough Win that Cho Kyoung Ho will perhaps be best remembered for. Together they won the Busan Metropolitan City Stakes twice – three years apart – as well as the KRA Cup Classic and the Grand Prix Stakes. Although in recent times, he had dramatically cut back on his riding commitments, Cho was still in the Stakes winner’s circle as recently as June this year when he guided Geumseongi to victory in the Sports Chosun Cup. Cho Kyoung Ho retires with career figures of 827 wins from 4964 rides including 29 Stakes race wins, six of which were in Korean Group 1 races. After a disappointing second half of the year, Fly Top Queen was back in the winner’s circle under the floodlights on a cold winter’s afternoon in Seoul on Saturday. Having endured the ignominy of finishing last in the Asia Challenge Cup in August and following it up with a lacklustre 11th of 12 behind old foes Wonder Bolt and Watts Village a month ago, Korea’s most expensive imported racehorse was sent off at just 4th in the betting for Saturday’s class 1 feature. However, this time she put in the kind of run that we came to expect from her earlier in her career. Bounding out of gate 12 under Park Tae Jong, Fly Top Queen was taken into the lead early in the 1400M race and never looked like getting caught, winning by 4-lengths on the line with Bichui Jeongsang and Here He Comes chasing her home not terribly effectively. It was her 6th win in 12 career starts (including one start in Japan). While not an especially quick time – on what was a day of rather slow times – but the manner of her victory suggests that she still has plenty more to offer in the likely event that connections opt to run her as a 5-year-old in 2015. As for other imports, fellow US bred Eye Say Who Dey, who won his first two races so impressively before suffering two setbacks, was also back among the winners at Seoul yesterday. The 2-year-old Bluegrass Cat colt took the honours in a very competitive race 8 which featured a number of up-and-coming overseas-bred horses. Racing returns to Seoul and Busan today, with class 1 events and plenty of good betting races at both tracks.